The lighting of a Menorah standing at 18 feet tall and live fire performance. Hon. Chuck Cahn, Mayor of Cherry Hill and Justice Lee Solomon addressed the crowd and were honored with the lighting of the Menorah. Thank you Mr. Eric Levy of Elite Heating & AC and Barclay Café and Starlite Productions for their sponsorships. A very nice crowd joined Chabad in Medford at the Menorah Lighting on the second night of Chanukah. Senetor Dawn Addiego addressed the crowd and lit the Shamash candle. Mr. Dov Kahan was honored with lighting the Menorah. A very nice crowd joined Haddonfield Menorah Lighting on the third night of Chanukah. the regional Cteen Chanukah Party in Center City. From stretched limo ride and a giant Menroah lighting to Chinese dinner and entertainment from Americas Got Talent Finalist, the teens had a blast! Dr. Phil Koren, friend and supporter of Chabad, lit the giant Chanukah Ice Menorah. 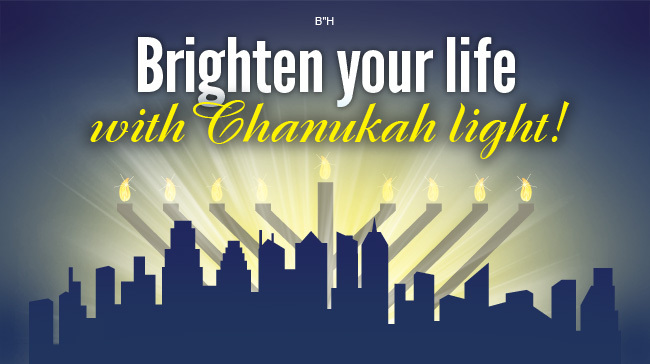 Program included, making Dreidel snow-globe booth, Doughnut decorating, Chanukah Jumbo ISpy, Lego Dreidel building, Frying Chanukah shaped potato chips and choosing their favorite dips at the latke bar. Many enjoyed the lighting of a 16 foot Menorah at the Sahara Sam's Oasis Water Park, followed by warm latkes and complimentary game play inside. Thank you to the Girlya family for the arcade gift cards that were given to all who participated. Hundreds of children from local schools (Beth El, Temple Emanuel, JCC Pre-School, Adath Emanuel and more!) got into the spirit of Chanukah with Chabad's hands-on Olive Oil Press workshop. From the Cherry Hill Winterfest, the Moorestown Community House, to Bowers in Cherry Hill, Chabad sponsored Menorah's lit up the night!